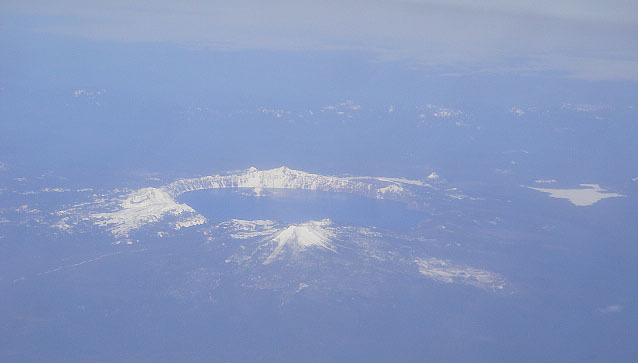 The azure glow of Crater Lake was about to be smudged by a band of wispy smoke blowing in eastward on the jet stream. As steely gray turned to black, I switched on my dosimeter, which immediately whined in alarm. 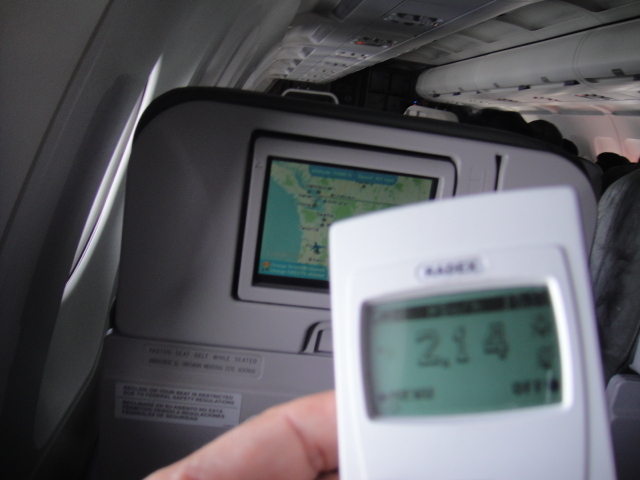 The radiation level inside the jetliner cabin hit 2.26 microsieverts, equivalent to twice the dosage at locations just 5 kilometers from the Fukushima No.1 nuclear plant. Although my nerves were thoroughly rattled by the buzzing, the dozing passengers were blissfully unaware of being bombarded by lethal neutrons. flying over the Oregon-Washington state boundary. The thin ghost shadow riding through the sky had no semblance to a fat rain cloud. Here, over the Pacific Northwest, was a vast plume of smoke from the incinerators of Greater Tokyo that burn radioactive debris from Fukushima Prefecture. The radiation levels gradually diminished as the jet made its descent to SEA-TAC airport. My journey to Seattle from Southern California had been prompted by a questionable claim from Washington State officials that the waves of tsunami debris from Japan are not radioactive. This sort of optimism is based on the assumption that any residual isotopes would be washed away in the North Pacific Current during the passage of more than a year over a distance of 7450 km (4630 miles). burning low-level nuclear waste from Fukushima. To the contrary, my gut instinct tends to be pessimistic, especially after having conducted several field research expeditions that discovered serious contamination not only in northeast Japan but also on the southernmost peaks of the Japanese archipelago. The spread of radiation, as far I have been able to tell, is unstoppable. The Olympic Peninsula is unexpectedly large. The three-hour drive out of Seattle wends through a cactus desert in the rain shadow of snow-capped mountains and then plunges into dark moss-hung stands of temperate rainforest. Beyond the great arc of Crescent Lake, reminiscent of Scandinavia or Switzerland, a road sign points to the town of Forks, location for the “Twilight” romantic vampire series. all debris from the 3.11 tsunami that hit northeast Japan. At the Last Chance gas station, the breakfast fare caters to the sport fishermen rolling their boats down a ramp onto the Salish Sea, which separates Washington State from British Columbia. My choice is a frozen barbecue burrito reheated in a microwave. Farther along, totem poles in front of a low-hung casino were carved by the Makah tribe known for their seagoing war canoes, which are still used to hunt whales. Unlike the Japanese fleet’s mechanical contraptions and ballistic projectiles, these muscular paddlers hurl old-fashioned harpoons in a fair contest between man and leviathan. 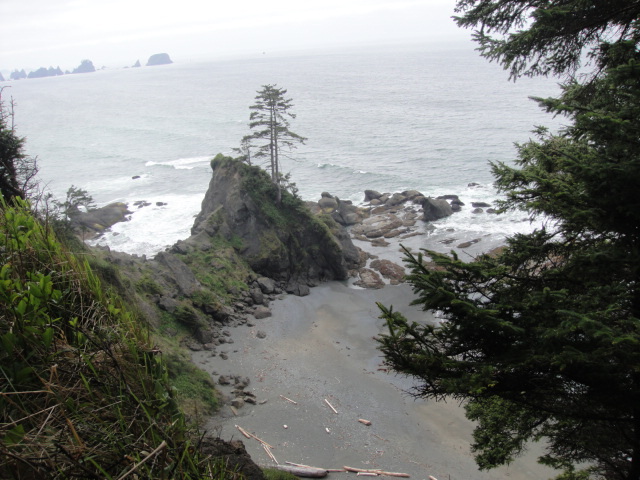 found along the shore of the Makah tribal lands. At last, the waves crashing on pristine beaches devoid of foreign flotsam, come into sight. After traveling 10,000 kilometers from the other side of the ocean, I find not a matchstick much less a floating house or boat from Japan. There were more bits of chewing gum wrappers on the trail than on these lonely stretches of sand and bonsai-studded rocks. 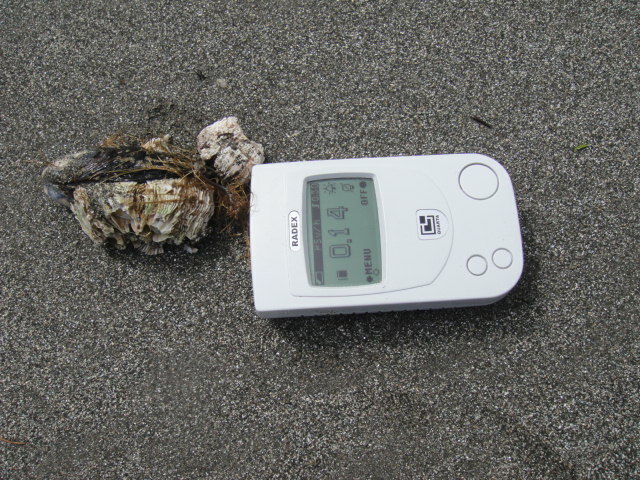 Disappointed, to say the least, I switched to a stratagem of measuring radiation in the seaweed that had washed ashore. Within a few minutes, a pattern emerged. Dry bunches of kelp above the dunes imply a serious radioactive event happening about a year earlier with readings of up to 0.28 microsieverts. More recently displaced wet seaweed show half that figure. 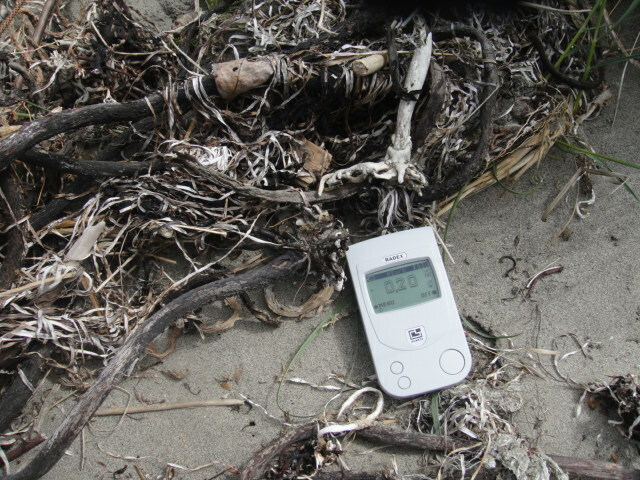 At the water’s edge, the readings are very low, only about 0.08 microsieverts, near the background radiation across the peninsula. The Pacific Northwest has abundant rainfall yet lacks the high humidity of Japan. Thus, instead of recycling radiation inland, the isotopes are washed out to sea, rapidly lowering contaminations on land and in the bays. It is a pity that my science kit does not include any instruments to detect toxic chemicals or microbiological contamination. The steep slopes of Japan’s northeast coast meant that most of the region’s tanks for oil, fertilizer and pesticides, along with refrigerant fluids, were stored along the shore and were swept away by the tsunami. Barnacles attached to a mussel have bio-accumulated radiation from algae and plankton. Calling it a day, filled with hard-earned futility, I headed back toward civilization. 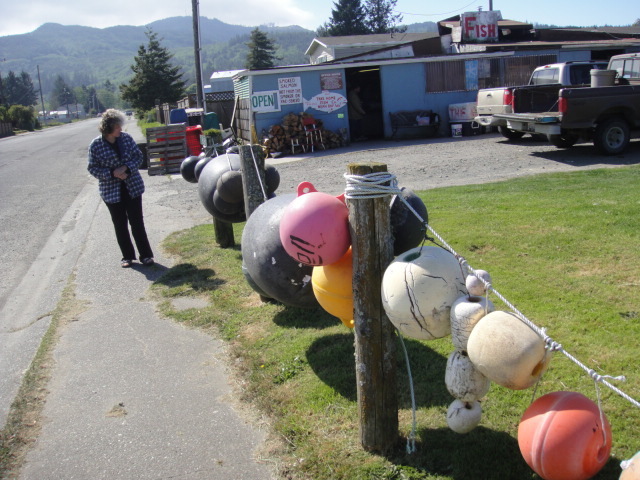 On the edge of Neah Bay village, the front yard of a shack identified by the sign “FISH” is festooned with a string of colorful buoys. On closer inspection, the plastic balls are covered with raised Chinese characters, a bit of Japanese phonetic script and the Roman alphabet. My experience along the Fukushima coast showed that rubber plastic and fishing nets absorb radiation more readily than wood or metal. 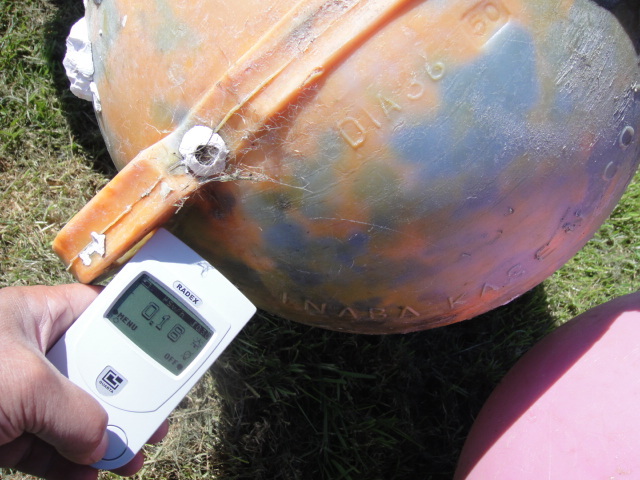 The dosimeter recorded an identical 0.16 microsieverts on every Japanese float, a level not immediately harmful to the rare passerby. Nonetheless, the figure is a good indicator of contamination on the journey from Fukushima. The Chinese balls are between 0.05 and 0.08 microSv. 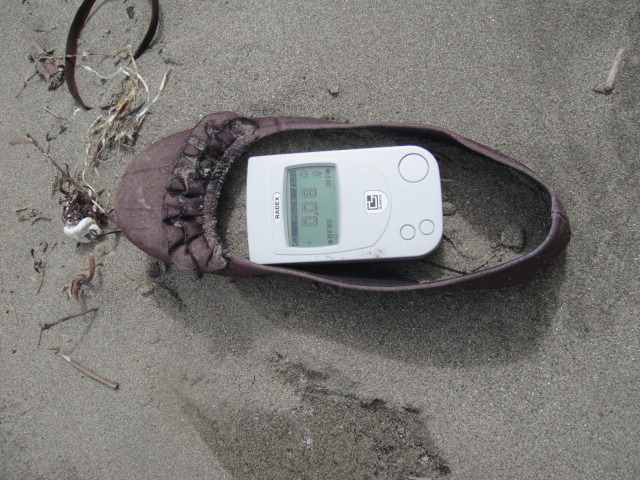 dowsed items like wet kelp or this cast-off woman’s shoe. Again, small differences disclose a larger story. The made-in-Japan floats, aboard trawlers or hanging to dry with nets in fishing villages, were pulled out to sea by the tsunami and soon became irradiated by contaminated water from the Fukushima nuclear meltdown. In contrast, the Chinese buoys were attached to long fishing nets laid outside Japan’s 200-mile maritime exclusive economic zone. Larger pieces of jetsam, for example, wooden beams, boats and buildings, ripped those long nets to shreds, releasing the Chinese buoys adrift. At that distance from the coast, radiation levels had become greatly diluted. So here, in these findings, was undeniable proof that the federal and state governments have again failed to inform American citizens of the radiation risk from Fukushima. For all the funding spent on climate research, oceanic studies, fisheries protection and marine biology, not a single official bulletin mentions anything about what a visitor can learn from a string of buoys in front of a salmon smokehouse. The state Bureau of Corrections responded to my query by answering that convicts from the two nearby prisons had never been assigned to the beach detail. Therefore, ordinary residents out of the goodness of their hearts did the hard work of removing flotsam, which included radioactive materials. The volunteers had no knowledge of the health risk and were given no advice on wearing protective gloves and eyewear or about decontamination methods. Gazing at the ocean from the closest point in the Lower 48 to Japan, the truth is as cold and bitter as the north wind. I shudder to think of what is still to come. 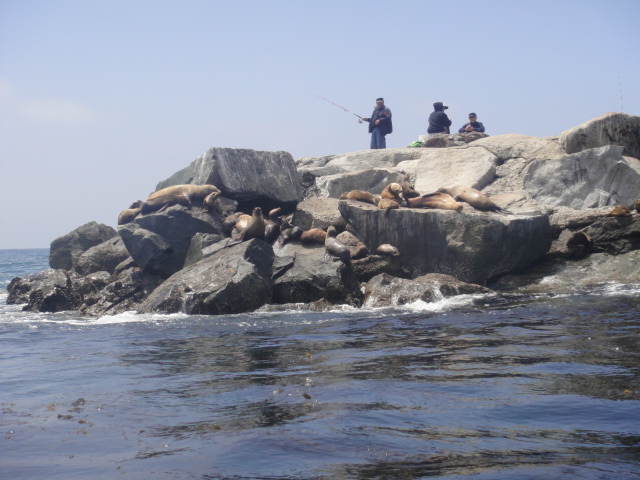 Before heading to the Pacific Northwest, I met a number of Southern California residents whose lives are deeply connected to the ocean. 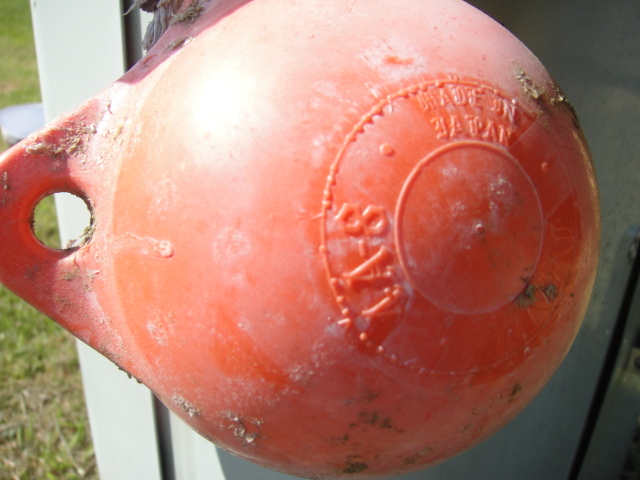 “Made in Japan” is impressed on a small buoy. Newport Harbor despite the presence of sport fisherman, a sight never seen before. radiation levels due to constant evaporation. Radiation readings along the Laguna Beach area indicate lower readings than in San Onofre or Santa Catalina, with one exception: Shallow tide pools affected by solar evaporation. 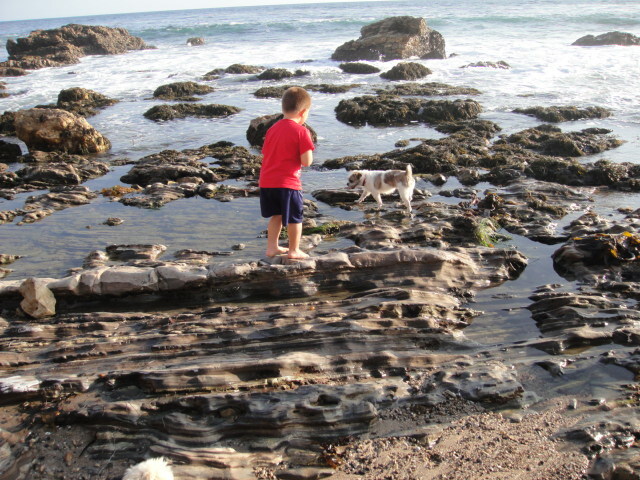 Flat tidal pools that are exposed at high tides tend to act like salt ponds, concentrating radioactive isotopes in the seaweed and in crustaceans. One large sea snail registered 0.38 microsieverts, and seaweed clumps were up to about 0.20 microSv. Sandy beach areas showed much lower levels, and thus are safer for beach goers, so act accordingly when positioning beach blankets. Author: Yoichi Shimatsu, a Hong Kong-based science journalist, provides health and environment consulting to residents of Fukushima on countermeasures to radiation exposure.